Understanding how your health care services or health care insurance deductible works can save you a lot of money on your health care costs. 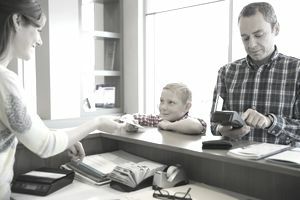 Most of us are familiar with the term deductible as it pertains to home or car insurance, but health care deductibles can be more complicated and although the deductible works similarly, there are several different kinds of deductibles in health insurance you should be familiar with to make the most of your coverage. The health insurance deductible is the amount of money you agree to pay before your health insurance policy begins to pay. In a way, the health plan deductible is very much like the amount of money you agree to self-insure before you start to claim on your covered medical expenses. There are three kinds of deductibles on health insurance policies. Here is what each one means so that you are sure to be able to understand how the deductible will impact you on different coverages. The comprehensive deductible is the easiest deductible to understand; it is one deductible that is applied across all the coverages and adds up until you have met your deductible. There is no guessing as to different deductibles for different coverages and how they apply. For example, some coverages may have a deductible, others may not and some medical expenses may require the deductible paid before starting to pay benefits. Essentially, it means some of your coverages will have a deductible and some will have no deductible, as in the example of the eye exam explained below. If you have a family health insurance plan through yourself or your partner, then the term cumulative deductible could be of interest to you. In insurance plans, deductibles can be defined as individual and family. Individual deductibles focus on the amount towards a deductible that each individual in the plan has paid. When you have a family maximum deductible, once the amount that all members of the plan have paid cumulatively towards a deductible meets the deductible, then the plan considers the deductible as being met. It does not require each individual in the plan to meet the deductible on their own first. This can help save money because every plan members contribution to the deductible will count. Are Health Insurance Deductibles the Same for All Coverages? Health Insurance Deductibles are not the same for all the coverages in your health insurance plan. Every plan is different, which is why understanding how the different kinds of deductibles work will help you. Some coverages and medical expenses have lower deductibles than your overall plan, some covered medical expenses may have no deductible. It depends on the plan you have chosen and the kind of deductible your plan offers. To understand how much money you will end up paying out-of-pocket, you should ask your plan provider 3 questions. What coverages are subject to a deductible? Are there any coverages that do not have a deductible? Do these coverages have a limit? What coverages require co-pay or co-insurance? Knowing the answers to these questions will help you understand your benefits in your health insurance plan better. Sometimes a plan will offer coverage for your costs on certain medical procedures or treatments “without deductible." Be careful as you read your wording to make sure you also check for the limits. Even though limits and deductibles are not the same, hitting the limit in a plan will force you to pay out-of-pocket. For example, sometimes certain medical exams like an eye exam may not be subject to a deductible, so it will be a “no deductible” coverage. Yet the eye exam cost, or even the cost of the glasses you end up being able to buy, may have a limit even if they do not have a deductible. If your eye exam costs $65 and your limit for the eye exam coverage is $50, then you will end up paying the difference, even though there is no deductible. Who Chooses the Health Insurance Deductible? You choose the health insurance deductible when you purchase your plan. Some people think they might only have one option, but you can always ask for quotes with different deductibles. Your savings on the costs could easily add up over time to the amount you need to cover the deductible if you put those savings aside. This puts you in control of the money, instead of the insurance company. If you never end up needing to use the extra money you save you come out on top. It really depends on the type of medical services you will use, and your medical condition. Should You Choose a Higher Deductible on Health Insurance? If you feel you are struggling to meet the cost of your health insurance, then you should consider if you are putting yourself at too much risk by taking a higher deductible to save money. It is very important to consider if you can afford the higher deductible in an emergency. Putting yourself in a situation where you can not afford to pay the deductible in your medical plan is not a good idea, so think long term when choosing the health insurance plan. It’s not about the cost today, its about the cost when you need to use the insurance. TIP: Consider if you had to come up with that deductible tomorrow, would you be able to? If the answer is no, then find a plan that will work for your budget. Remember, the whole point of your health insurance is to get you care when you need it. One option if you can not afford a higher deductible today, is to make yourself a plan where you try and save some "health insurance" money every month into an emergency fund for health insurance deductibles. Then after a year or two, you may have saved enough to take a higher deductible when it is time to renew your health insurance plan. Then you'll pay less for your health insurance long term. Health savings accounts provide numerous advantages and this may be another option to learn more about as you learn about how to make the most of your money with health insurance plans. Finding ways to save money is really hard, but it is a lot worse when you’re trying to scrounge up money to pay for an emergency and your health is at risk. If the emergency never happens, then you will have a nice cushion of savings if you ever need it.